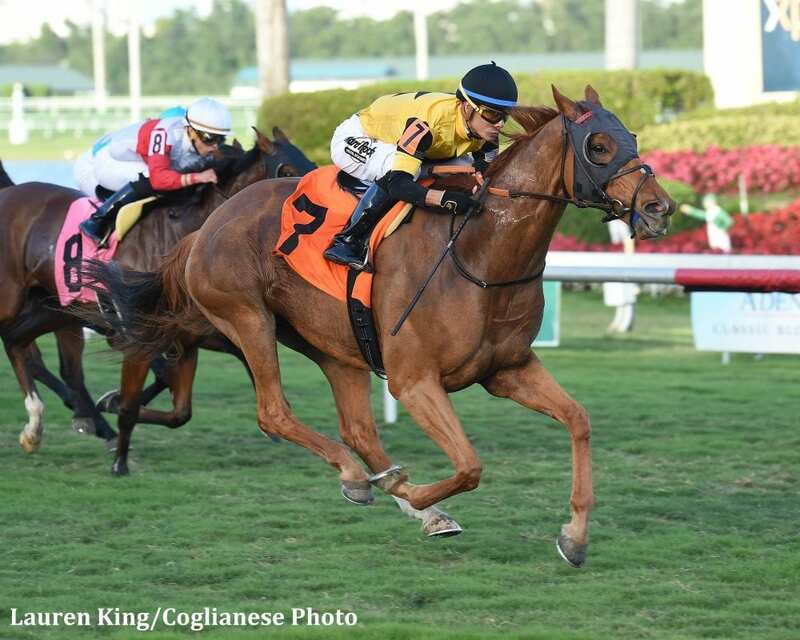 Multiple graded-stakes winner Ring Weekend sparkled in his 2018 debut Sunday at Gulfstream Park, rolling through the stretch to score impressively in the featured 11th race, a mile optional claiming allowance on turf. Owned by West Point Thoroughbreds, the 7-year-old gelding saved ground along the backstretch under Jose Ortiz as Hockey School cut out solid fractions of 24.21 (seconds), 47.18 on his way to a six-furlong clocking in 1:10.18. Ortiz swung Ring Weekend to the outside on the far turn and the trainer Graham Motion's durable turf star responded with an extended run to draw away from his nine rivals while completing the mile in 1:34.75. Ring Weekend, who has earned more than $1.5 million during his career, scores his eighth career victory. Profiteer and Saham also rallied off the fast pace to finish second and third, respectively. This entry was posted in NL List, Racing and tagged Graham Motion, Gulfstream, gulfstream park, jose ortiz, Ring Weekend, Terry Finley, west point, west point thoroughbreds, Winter Olympics by Press Release. Bookmark the permalink.